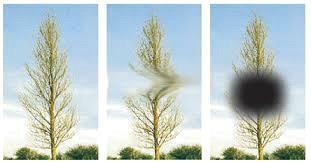 Macular Degeneration (MD) is a retinal degenerative disorder that causes a progressive loss of central vision. It’s the most common eye disorder and the leading cause of vision loss in those over 50. As it is an age related disease, it is also known as Age-related Macular Degeneration (ARMD). An estimated over a million Canadians and 10 million North Americans ALONE either have AMD or are at substantial risk of developing it. MD can make it difficult or impossible to read, drive or recognize faces. There are two types of Macular Degeneration: Dry MD and Wet MD. Dry MD is less severe type. Over 80% of MD cases are this type. The macular is the central area of the retina, which provides the most detailed central vision. Dry MD is characterized by the slow accumulation of tiny protein and fat-containing “drusen” deposits underneath the photoreceptors in the macular eventually merge together and damage the photoreceptors cells in the retina. Symptoms of dry MD may include: fuzziness of central vision, the need for increased lighting to read, distortion of objects, or the development of a central vision blind spot. These symptoms tend to occur gradually over years. Acupuncture, Herbal and Dietary Supplements and life style change can help and have very high successful rate at early stage to prevent the “drusen” getting bigger which presents a great risk for the progression to wet AMD or going to eventually lose vision down the road. 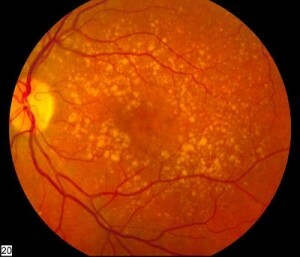 Wet MD accounts for about 10 percent of all cases of Macular Degeneration. It is more severe, more aggressive and threatening to one’s vision. 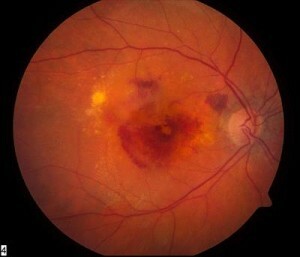 In wet MD, abnormal blood vessels grow under the retina and the macula. These new blood vessels may bleed and leak fluid which damage photoreceptor cells causing the macula to bulge or lift up, distorting or destroying central vision. Wet MD often progresses rapidly and can cause severe loss of central vision. Some of the risk factors of Macular Degeneration include: family history, high blood pressure, elevated cholesterol, obesity, smoking, and poor nutrition like fast food. Although much research is being done on finding treatments for Macular Degeneration, no current treatment in western medicine world is effective for the dry form. For the wet form, if the leakage is caught in the early stage, there is a potential to treat it with laser or an intraocular injected medication. The laser is used to cauterize the leaking vessels. It will damage a small area of retina but can save vision in a larger area. But it cannot prevent new blood vessels grow underneath again. Repeated laser treatment is not an ideal option. The intraocular injection treatment consists of repeated (usually every 4 to 6 weeks) injections of drugs such as Luentis, Avastin, Macugen and Eylea that block the growth of abnormal blood vessels in the eye, which is the cause of wet Macular Degeneration. Unfortunately they all have many side effects from mild such as eye pain, small spots in vision, blurring and double vision and increased eye pressure to more serious ones such as eye infection, detached retina and cataracts. These side effects can make vision worse. There have been reports that Avastin, the least expensive among the four which is an anti-cancer drug has caused some Wet MD patients serious eye infections and they ended in the loss of their vision in their treated eyes. However, certain Traditional Chinese herbal remedies and Micro Acupuncture can stop the leaking vessels safely without injecting to the eyes which means there is no any side effects. Once back to MD Dry stage, Micro Acupuncture, herbal or/ and dietary supplements with high doses of antioxidants, Lutein and Zeaxanthin, can slow down the progression and improve the visual acuity. Many MD patients are able to get their driver licenses back after the treatment.